There is little cosmogony antedating Glooskap; who is said to have ‘come out of the mists of the swamp’ the Indian idea of chaos. He shot arrows into the ash tree and called mankind therefrom. He named and changed for man’s use the already created animals, reducing the size of some of them, and adapting them to their mode of life. Still a friend of the Wabanaki, he hears their call and aids them in time of need. The stories told of Glooskap’s life are innumerable and varied. When he left his people, he went down under a great cobscook (water fall); and there, on an island, he remains; in company with his adopted grandmother. His wigwam is lined with pockets made of bark which shines like silver. He is making arrows; and when he has the pockets full of arrows he will consume the world in a fire, caused by his arrows flying thick and fast in battle.2 Probably no better description could be given of his supposed nature and attributes than is comprised in the tales that have been localized by the Etchemin, of which the following is a fragmentary example:How Glooskap chased K’chiQuabeet. But the Great Beaver had been warned of his danger, and had already left for the St. John river, where he built a dam. The ledge of rocks at the Falls is still called ’ChiQuabeetawickpahegan,’ or Great Beaver’s dam. He then started for further up river. When Glooskap found the beaver had escaped, he followed after him as far as the dam at St. John; breaking the dam, in hopes that the rush of water would bring the beaver within his reach. The Glooskap took a large stone and threw it up river, expecting to drive the beaver down stream again. But the beaver had gone into Lake Ahbensquaatuct, where he has built another wigwam; and the rock which Glooskap threw fell near Tobique, where it may still be seen. 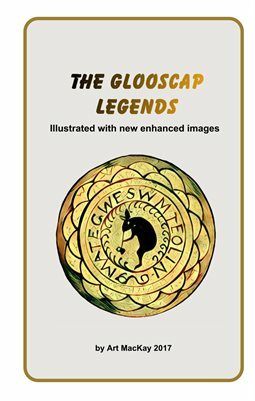 Besides having such superhuman powers, which he always exercised for the good of his people, in some of the tales Glooskap seems to have had a beneficent control over the forces of nature.